There is a dangerous 2,000-kilometre fault line running through the Middle East between Beirut and Bahrain via Damascus and Baghdad, which marks the present line of demarcation between the two main branches of Islam, Sunni and Shiite. The 1,300-year-old schism between Sunnis and Shiites was caused not by a theological dispute (those came later), but by rival clans in Muhammad’s tribe, the Quraysh, squabbling over the succession after his death in 632 AD. 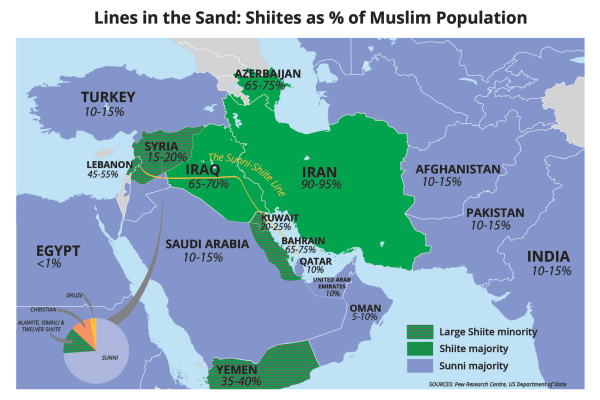 Mostly the “Sunni-Shia Line” lies dormant, and ordinary Sunnis and Shiites live out their separate lives, side-by-side in relative harmony. In Lebanon and Iraq it has not been uncommon for Sunnis and Shiites to intermarry. But the Line is still always there, just below the surface, and it has recently re-emerged as the most significant factor reshaping geopolitical relationships in the Middle East, a region where religion and politics are always inextricably intertwined. Suppose it, at least for now. And in that context, consider as a counterweight to all the talk about Iran, two fascinating pieces by the Pakistani novelist Maniza Naqvi. I fear to imagine a county which produces no art, film, theater, song or dance. Yet such is the country created by the State of Saudi Arabia. I fear the reasons which cause 16 million citizens most of whom are not Saud in Saudi Arabia to remain silently compliant. The bulk of this population is under the age of 25 and disempowered and is ruled absolutely by old men who do not tolerate dissent or diversity of opinion. I fear the mindset that treats women as blots and clots to be erased or managed. I fear that the people unlearned and illiterate impressed by influence and the purchasing power of Saudi Arabia might be confused and unable to distinguish the House of Saud as being apart from the origin and the authors of Islam. I fear that this may be the case for Pakistan where matters are so far gone that if the father of the Nation, Mohammad Ali Jinnah were alive today he would not be able to go about freely for fear of being shot to death for being a Shi’a. I fear that after thirty years of petrodollar bonanzas and propaganda, Muslims are unable to delink Islam from the House of Saud. There are 5000 Saud and in comparison there are 1.2 billion Muslims all over the world. A majority of whom, for a myriad of reasons including illiteracy, poverty and sudden wealth are unable to resist or protest against the Saudi influence upon them. I fear that the populations of the world are unable to resist, protest and fight against the privatization of all that is their sacred to them: their lands where they grow their food, to the places where they congregate and live, to their own thoughts and even their bodies. This is addressed to Muslims who think that Islam is under attack: They are right. Just take a look at the images of the House that Abraham built, the Ka’aba and see how progresses that ancient attack. 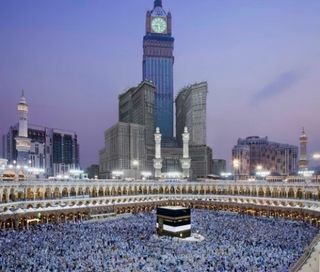 Just look at the transformation of the environs of the Ka’aba and the Haram Shareef into a garish resort rivaling Las Vegas or Atlantic City. Just look, at the transformation of the sacred environs of the Haram Shareef into a shopping mall and Disney world–to understand the war on Islam and who is responsible for waging it. Just look at this and see how Islam has been trafficked as though it were a bonded slave, dressed up in bells and baubles to be whipped and sold in the marketplace. Much is at stake if people are not silent. Much is at stake if people remain silent. I fear that Haj and the Ka’aba, a central principal of Islam, sacred to 1.2 billion people have been privatized, by an estimated 5000 people belonging to one family. Why? How is the privatization of the Ka’aba different from the wholesale seizure and privatization of the commons and public lands and spaces all over the world? 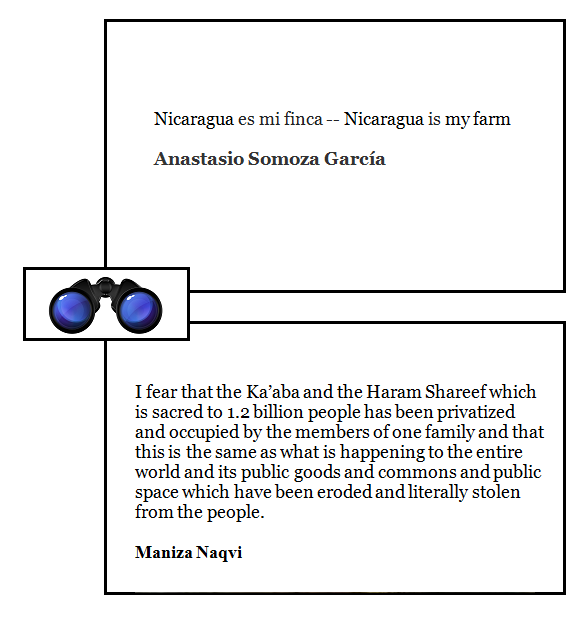 I fear that the Ka’aba and the Haram Shareef which is sacred to 1.2 billion people has been privatized and occupied by the members of one family and that this is the same as what is happening to the entire world and its public goods and commons and public space which have been eroded and literally stolen from the people. With this profound difference: that the Ka’aba is the Qibla, the point of orientation to which all Muslim prayer turns, as others orient their prayers towards Jerusalem.